Samsung is reportedly developing a smart speaker powered by its digital assistant Bixby. The speaker, currently codenamed Vega, is still in the early stages of its development, so there isn’t any information on its specs, any features it will have, or even a provisional release date. When it does come out it will be entering a market that is already fairly busy. The Echo and Dot from Amazon, Google Home, and Apple's HomePod are all vying for attention at the top of the market, and then you also have Harman Kardon’s Cortana-powered Invoke, and the plethora of Alexa powered third-party speakers. With all that competition, the Vega will have to do something pretty exceptional in order to stand out. Bixby does seem like a very competent digital assistant, but with the significant delay in the voice assist launching in the UK and US, we have our concerns. This isn't the first that we've heard of Samsung working on a smart speaker. The image above is from a patent filed by Samsung that (if it is the Vega) would make it a competitor for the Amazon Echo Show due to the inclusion of a speaker and a screen. 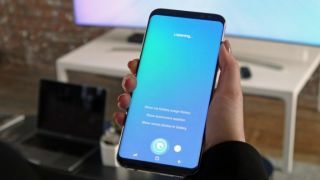 Bixby was originally supposed to launch with the Galaxy S8, but users are still waiting, meaning many Galaxy owners that care about digital assistants are using Google Assistant. There have been a few reports about why this delay is happening, all of which seem to be pointing towards a lack of resources in translating the digital assistant into English from Samsung’s native Korean. This means that Bixby is currently only available in South Korea. Obviously the information is all fairly thin on the ground at the moment but as soon as we know more we'll let you know.